"Easy and delicious baby back ribs." Place the ribs into a large pot and cover with water. Bring to a boil over high heat; reduce heat to medium and simmer until tender, about 1 hour. Meanwhile, stir the ketchup, vinegar, Worcestershire sauce, sugar, salt, and liquid smoke in a saucepan. Bring to a simmer over medium-high heat; reduce heat to medium-low and simmer uncovered, stirring frequently, until thickened, about 30 minutes. Preheat the oven's broiler and set the oven rack about 6 inches from the heat source. Line a baking sheet with foil. Drain the ribs and place meaty-side-up onto the prepared baking sheet. Brush the ribs with half of the barbeque sauce. Broil in the preheated oven until the sauce has turned sticky and lightly browned, about 7 minutes. Turn the ribs over and brush with the remaining sauce. Continue to broil until the sauce has turned sticky, about 7 minutes. 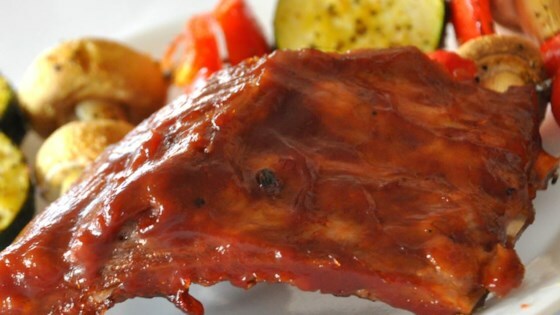 See a sensational shortcut method for making baby-back ribs. the BBQ recipe is amazing! I really like this recipe all together, but I grill the ribs instead of broil. Everyone loved these ribs. Next time I will doubled the BBQ sauce amount b/c there was just enough to cover the ribs. We like them dripping! Awesome! I didn't have any liquid smoke so I used a couple tablespoons of bacon grease. Perfect.